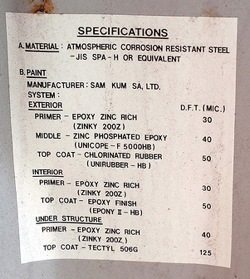 Even though shipping container specification has been in place in the form of international standards since 1967, this is still an inexact science. There are five International Standards Organization (ISO) standard lengths varying from 20 feet in length to 53 feet in length, and several different heights, varying from 4.25 feet to 9.5 feet. The material varies, as do the uses, so the internal measures aren’t set in stone. Only the width aspect of container specification seems to be standardized at 8 feet. Early shipping tycoons would set the container specs to meet their specific needs. Matson used 20 and 24 foot containers along its west coast to Hawaii route because in analyzing their shipments those sizes made the most sense. They outfitted their converted World War II freighters with a racking system that fit those containers perfectly to enable containers to be stacked six deep and to be off-loaded and on-loaded at the same time at the shipping dock using special crane equipment. The first to come up with the container specifications that allowed intermodal, international containerization was Malcom McLean’s Sea-Land (known as Pan-Atlantic until 1960). He employed a container expert named Keith Tantlinger in 1955 to modernize Pan-Atlantic’s container system. The shipping container specification that McLean required of Tantlinger included that containers be on-loaded and off-loaded from ships quickly, and that they be fitted easily on trucks and trains directly without opening and changing the containers. Tantlinger not only came up with the ideal box design, he also designed the cargo hold racking system that allowed stacking of the boxes six high, and made it possible for crane operators to on-load and off-load in one operation. In order to assure the American Bureau of Shipping that this heavy stacked load would not endanger the lives of the ship’s crew, Tantlinger also designed the corner fitting and twist locking mechanism that became the key to shipping container standardization. The corner fittings assured that, no matter the length or height of the container, the corners would fit securely into the racking system, and onto the fittings placed on truck and rail road beds in order to hold containers in place. This one aspect of shipping container specs is responsible for the growth and globalization of shipping so vital to the economic well-being of nations today. The International Standards Organization (ISO) recognized the importance of corner fittings to global containerization and approved a tested and improved version of the Tantlinger design in June 1967. 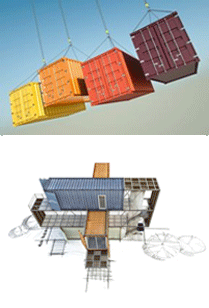 From that point on this one shipping container specification has driven the success of containerization as a vital element of international commerce.